Hello and Welcome to the Summer Time COLLABORATION BLOG HOP with Studio Katia and Sunny Studio! Добро пожаловать на Летний Блог Хоп по сотрудничеству компаний Studio Katia и Sunny Studio! Обе команды решили отпраздновать летнее время с веселыми и красочными открытками с использованием штампов от Sunny Studio и ножей и украшений от Studio Katia. Обе компании будут дарить призы, так что убедитесь, что Вы прочитали весь пост до конца, чтобы увидеть, как выиграть! For today I made three projects - two cards and 2 tags. 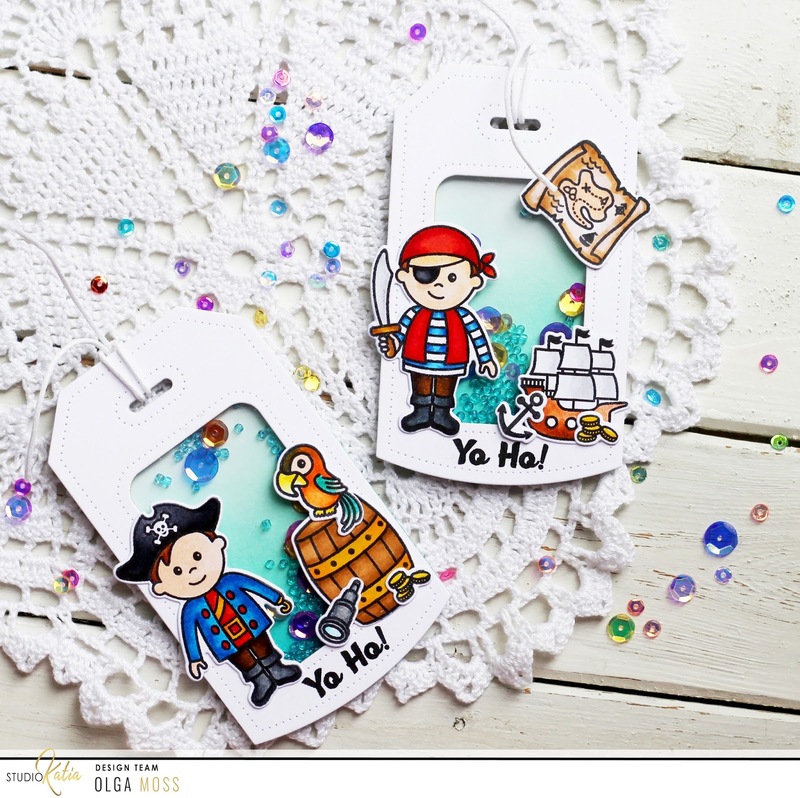 And for my first card I played with Pirate Pals Stamps - by Sunny Studio and Dotted Ovals creative dies - by Studio Katia. I made a shaker with a floating boat - from stamp set and Crystal Rainbow Fusion sequins, Clear Rain Drops, Summer Sky seed beads. Then I played with this super fun stamps, coloring and cut them all. This was my first experience of using the Sunny Studio stamps and I love it! Dotted Ovals creative dies - one of my favorite sets! Для сегодняшнего дня я сделала три проекта - две открытки и два тэга. И сначала я с удовольствием наигралась с супер веселым набором штампов Pirate Pals Stamps - от Sunny Studio. Я сразу наштамповала для себя много-много фигурок пиратов и остальных элементов из набора, раскрасила их, совсем не в привычные для пиратов цвета и вырезала их координирующими ножами. Затем я сделала шейкер при помощи набора ножей Dotted Ovals creative dies - от Studio Katia и наполнила его пайетками Crystal Rainbow Fusion, прозрачными дропс Clear Rain, бисером Summer Sky. Это мой первый опыт работы со штампами компании Sunny Studio и могу с уверенностью сказать, что мне очень понравилось! Ну а овалы - это просто маст хэв всех кардмейкеров, как и круги. For the next card I used Pirate Pals Stamps - by Sunny Studio and Dotted Balloons (I used only Doily die) creative dies - by Studio Katia. For the background I used my Distress Inks, I blended two colors. So I covered background with the prepared area with doily. Then I added stamps elements, sentiment and Clear Round Drops. Now it looks so fun! Для второй открытки я использовала снова набор штампов Pirate Pals - от Sunny Studio и набор ножей Dotted Balloons (я использовала только нож - Doily) - от Studio Katia. Затем я затонировала основу при помощи двух цветов моих Distress Inks и наклеила сверху заготовленную площадь с волнистыми кругами. Потом я приклеила фигурки, поставила сентимент и украсила открытку прозрачными дропс Clear Round Drops. Мне кажется, получилось интересно! And for the third project - the set of two shakers - I combined Dotted Shaker Tag creative dies - by Studio Katia and Pirate Pals Stamps - by Sunny Studio. I stamped and colored the cute pirates and some of elements. Then I cut two shaker tags. And filled them with Crystal Rainbow Fusion sequins and Summer Sky seed beads. Then I pasted pictures from above. That is all! И для третьего проекта - набор из двух шейкеров - я соединила нож-тэг Dotted Shaker Tag - от Studio Katia и штампы Pirate Pals - от Sunny Studio. Я вырезала четыре тэга и сложила из них два шейкера, наполнив внутри пайетками Crystal Rainbow Fusion и бисером Summer Sky. Сверху приклеила готовые фигурки и повязала на тэги шнурочки. Готово! 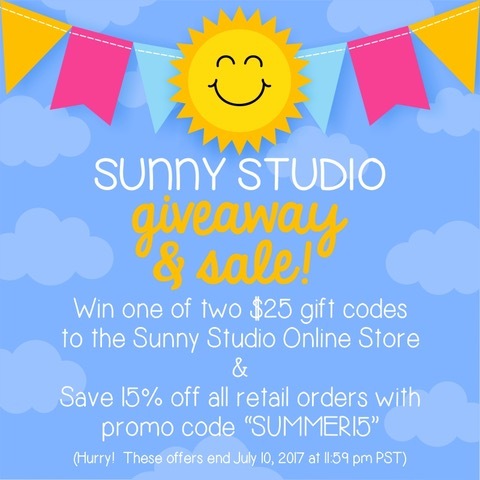 prize pack from Studio Katia and two $25 store credit from Sunny Studio! The winner will be chosen at random from the collective blog hop posts. announced on the Sunny Studio and Studio Katia blogs on Wednesday July 12th. Мы разыграем ТРИ приза - один от Studio Katia и ДВА купона на $25 от Sunny Studio! Победитель будет выбран случайным образом из общего списка блогов. Обязательно прогуляйтесь по всем блогам. Вы не сможете знать, в каком блоге будет выбираться победитель, так что, чем больше вы оставите комментариев, тем больше шансов у вас будет на выигрыш! Комментируйте блоги до 10 июля - победители будут объявлены в блогах Sunny Studio и Studio Katia 12 июля. Nancy Damiano - your next stop! Желаю вам отлично повеселиться на блог хопе и хорошего дня! I love the tags you created!! So cute! Very fun cards and tags. I love the beautiful vibrant coloring you did on each project. Such gorgeous projects! Your coloring is amazing! Beautiful work! Very vibrant and alive! Cute use of pirate stamps -- every project a treasure! Wow, your coloring is AWEmazingly beautiful. And your cards & tags are so fun. I love shakers. The shaker card is brilliant! Love the ship inside the shaker element. I love your cards and tags! Very cute! You are so talented!!! Love all the designs! Gorgeous ink blending and wonderful use of the dies on these great pirate cards! So much inspirations. Beautiful colours and colouring. The tags are my favourite. Wow, your pirate scene cards are amazing! The shakers are so fun and I especially like the pirate ship on the waves within your shaker. Awesome idea! You have made three terrific cards!!! The pirates were a really fun choice and I think your designs are amazing!! I adore the vibrancy of your soft colors and the cute designs! Very refreshing cards ! Your colors are very vibrant. Super cute cards and tags! I have the Pirate Pals set and love it! Love the cute cards! So adorable & just right for kids birthdays! Lovely projects! Love how you colored the images and the background.-Maria Giselle B.
through a porthole. Great shape. sides of the cards are a nice idea. thanks for sharing some fun cards. Awesome cards! You are sooooo talented! I look forward to looking at your creative ideas! Great variety of pirate themed projects. Gorgeous projects! I love all these stamps and dies together and your coloring is spectacular! Such cute cards and tags!! This is my first time with these two companies and love all the stitched dies. The dotted ovals are a big must have!! I've never thought to use a die like you did the dotted balloons and love the soft background colors you used. Oh oh, I'm in trouble!! I so want that dotted shaker tag die.........so cute!! Very cute projects. Love the belated birthday sentiment...........exactly what I would say. Love the cards and tags, very fun projects! So pretty!! I love your cards and tags, beautiful shakers. Everything is colored so pretty too!! Love love love your pirate cards!!!! You did such a good job designing and creating them. Nice cards. The pirates and their treasure are so cute. The little pirates would be so cute on a card for my nieces and nephews. Your coloring is great! These cards are so adorable! I can hardly stand it. So, so cute! Shaker TAGS! So much fun! Ahhh! These are just so cute! And so much color and sweet scenes! Fabulous work! Adorable cards and tags! Colors are gorgeous. These little pirates are adorable. I love the shaker card and tags so pretty and so much fun. Beautiful job. Darling cards and tags with beautiful coloring! I love the stamps and dies you used! Love the die you used from the Dotted Balloons set! Your projects are amazing! The pirates are awesome. Oh my goodness, these are lovely! I'm loving the pirate trend! Captain Jack Black have nothing on these pirates...these are the cutest pirates I've ever scene!!! Love those darling pirates and your ideas are fantastic. Fabulous shaker card and tags. Olga, you have such an artist's eye. I love everything you made and will definitely come back to your blog in the future! Lovely shaker cards and tags! You have such talent! I especially love the shaker card!! Great job!! All your projects are so adorable! Wonderful coloring and texture!! These projects are fabulous! That pirate shaker card is my favorite: I just love the ship rocking along in those beautifully ink-blended waves! A great job on them all. These cards and tags are so cute! I especially love the one with the porthole through which you can see the ship. They are all very creative! Your cards are Fabulous! LOVE! Adorable projects! The cards are cute. And I really love the tags! Hey yo, the pirates are so popular and funny this summer! You did amazing projects with them. I never knew pirates could be so cute! You did an amazing job with all of your projects! Adorable! Love all of your projects Olga! I love both cards and both tags! Great work! Thank you for sharing! Wow! What fun cards! Such cutie pirates! Happy Hop! And thank you for an inspiration! I know your boys love these pirates! They are so cute! These card and rags are great! I really love the tags! I love the 2nd card. The doily cutouts look beautiful. What a great series of cards and tags, perfect for little boys! I love your pirate cards! So cute!